The cheerful cascade of pealing bells wafted through the market town of Yeovil the week before Christmas. 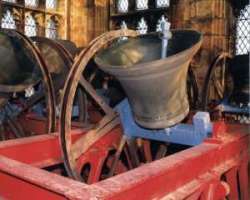 What a rich experience as bell ringers from throughout the South West of the UK shared their unique talents. Bounding with energy and melody the sounds drifted across the landscaped gardens and tumbled down wintery streets bringing hope and cheer in their wake. Sharing the thought with others that same morning, I discovered a keen organist in the same town. So the idea is born and hopefully will soon gain momentum…… This week was able to share the idea again with another organist. Believe there is mileage in the concept. Will continue to enocurage others to consider such a project. Learn more about opportunities to ring near where you live.